When I was in graduate school studying curriculum and instruction, a neighbor was a graduate student from India who was studying biology. Sometimes we would discuss our coursework and projects. “We don’t have five books that all U.S. students read,” I said. “Three? Two?” I continued to shake my head no. “Surely there is one book that all American students have read,” he said. “I find that puzzling,” he said. As this conversation had progressed, I, too, as a high school English teacher, found that total diversity of American curriculum pretty amazing. Not one book that every American student would have read in high school. I’m certainly not for a lock-step, totally prescribed curriculum — what some fear that the Common Core Standards could evolve into. But having some common curriculum concepts, such as some common readings, could be useful. 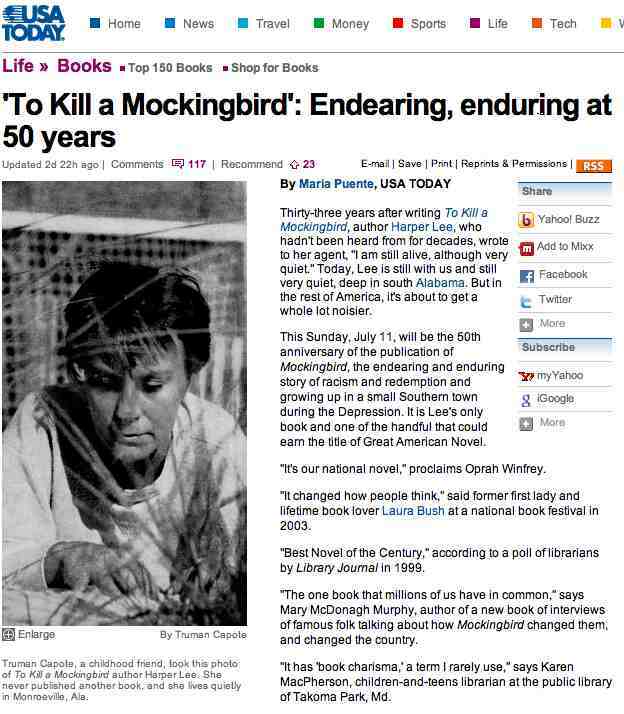 That conversation came back to me as I’ve been reading about the celebration of the 50th anniversary of the publication of ‘To Kill a Mockingbird’ — printed 50 years ago today. If I were going to recommend what books could be included in the five that every U.S. student would read in high school, ‘To Kill a Mockingbird’ would be on my list. The novel was one of my favorites to teach when I was teaching American lit as a high school English teacher. The story provided a number of storylines that opened up discussion about prejudice — racial issues, views about those with mental health issues, socio-economic differences in a community, and how much children should be listened to. Both adults and young people were strong characters. Too often stories that include both adults and youth depict one or the other as clueless or careless. There were no easy answers to complex questions about right and wrong, truth and justice, and family relationships. The novel was a great source of discussion about themes, character development, plot development — and the many issues that touched on the lives of the students but would have been too personal or complicated to take on outside the context of this novel. Would “To Kill a Mockingbird” be on your list of the five books every high school student should read? What would be your recommendations? I’ve been meaning to post a comment directly on this post, but it looks like my own posts on this matter, inspired by your blog, have found their way here via trackbacks. I will add that no notion has made me think so much about how we might make a singular yet broadly sweeping change to American education by adopting a handful of worthy novels for everyone to read. Every student at my high school is assigned “To Kill a Mockingbird,” and I think that’s the way it should be. I’m not sure every student is prepared to read the book in ninth grade, but I’m glad our students are exposed to the material.